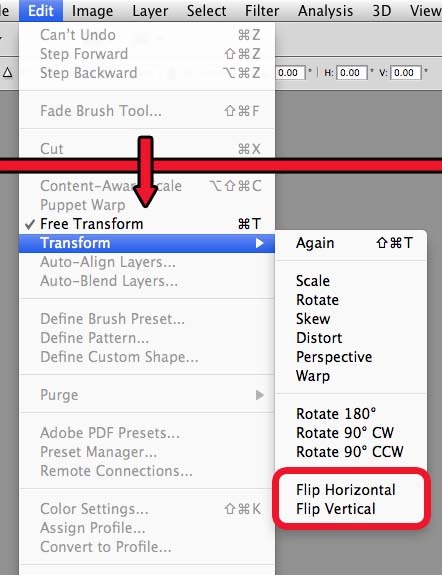 The Free Transform / Transform commands let you make transformation changes to the contents of a layer. These changes include - scaling, rotating, skewing, and flipping. To transform the contents of a layer, you must first select the layer in the Layers panel. Then go the menu bar and choose Edit > Free Transform. This will bring up the Free Transform options in the Options bar. To scale the width and/or height of the contents of the selected layer, type in the desired scale value in the horizontal and vertical scale input text fields. A value beyond 100% makes the object bigger. A value below that makes the object smaller. You can also change the rotation angle. A positive value rotates clockwise. A negative value rotates counter clockwise. To apply the transformation changes, click on the Commit transform button. To flip the contents of the selected layer, go to the menu bar and choose Edit > Transform. Then choose either Flip Horizontal or Flip Vertical.